I picked up Close To Home after two independent recommendations. I was having lunch with a friend who brought up Cara Hunter’s novels as gripping page-turners, and then a couple of weeks later my sister also mentioned that she’d picked up Close To Home as something to read while feeling ill and had been so gripped by it that she finished it in one sitting. Close To Home is the first in a series of police procedural crime novels, set in Oxford. Don’t expect the dreaming spires and eccentric academics of Inspector Morse, though; the focus here is town rather than gown (there’s a nod to this when the detective inspector who narrates sections of the story tells us that he drives a normal car and doesn’t do crosswords). The mystery begins when an eight-year-old girl, Daisy Mason, disappears from a barbecue at her parents’ house. The Masons seem like a completely average family – father Barry is a builder, house-proud mum Sharon is keen to make friends with the neighbours, and Daisy’s brother Leo is a nervous, football-obsessed 10-year-old. 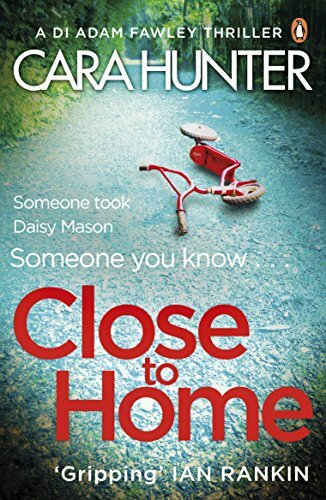 But when any child disappears and there are no obvious suspects, it’s their family who come under the closest scrutiny, and the police can’t help feeling there’s something not quite right in the Mason household. All families have secrets, but the Masons seem to have more than most. Told in short chunks from different points of view, mixing DI Adam Fawley’s own first person point of view with the perspective of his colleague, DC Everett and flashbacks to Daisy’s life in the buildup to her disappearance, plus news reports and social media posts about the case. At first, I wondered if this quickfire approach might make the narrative feel disjointed, but I found I settled into the staccato rhythm. The pace is accelerated by frequent cliffhangers and the fact that the investigation itself unfolds in a matter of days, so there’s a real sense of urgency to the story. The intense focus on the the investigation itself means that all we really learn about Adam Fawley is that he and his wife have also, at some point and in circumstances not revealed until the end of the book, lost a child. If you are someone who is typically more interested in the detective than the crime, you might find this book a little lacking - but this is the first book in a series, and I don't doubt that Fawley's character will be fleshed out in subsequent books. I certainly found him credible and what we do learn of his home life and his relationship with his wife and their lost child is sensitively written. The way the investigation is portrayed also means we get a strong sense of how much of police work is luck, how easy it is for detectives to miss key information simply by not asking exactly the right question or by assuming a fact without checking. These aren't cerebral, puzzle-solving geniuses: they're flawed individuals who, like everyone else, make mistakes. I'm currently undecided whether I was satisfied by the ultimate resolution of the mystery. There are elements of it I didn't find tremendously plausible, but equally, I didn't see it coming. This is the ideal crime thriller for those times when you want to immerse yourself in plot: the written equivalent of a gripping police drama series that you'd end up tearing through in one sitting if you had the box-set.